There’s so much more to making a meaningful difference in your world than swooping in with a once-off donation or classroom painting project, and Hatch, a consulting engineering firm in Greenstone has been a great example of how a long-term relationship with Rays of Hope has changed the lives of Alex residents. 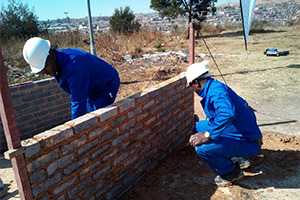 It started with Mandela Day in 2018, and Maché van Aswegen, a recent graduate engineer from Hatch in Greenstone, was looking for an opportunity to build some sustainable skills into people from Alexandra, and she motivated for the company to work with Rays of Hope. Through the project with Hatch, 22 people (including a few women) were trained in bricklaying and plastering, and another 25 women were trained in sewing. Both of these skills sets equipped the people trained to go out and find employment both in the short and longer terms. When asked why bricklaying and sewing were the skills selected, Maché said that bricklaying will hopefully enable the men to find work with some of the construction projects that she sees from her office window every day. For her, the sewing skills transfer was more personal as she had been looking for someone to sew for her and struggled to find anyone with suitable skills – but now she has more than 20 to choose from! Maché took things even further later in the year by arranging for Hatch to sponsor 35 girls each with a pack of Palesa Pads. These reusable sanitary pads will make it possible for the girls to keep going to school through their periods, as many couldn’t afford disposable pads each month, forcing them to stay home and miss school. Rays of Hope will continue with ongoing initiatives including life skills, small business skills and further training opportunities, with the help of companies like Hatch, who looking to invest in the people of Alex. If your company wants to make a meaningful difference to the residents of Alex, contact info@RaysOfHope.co.za.